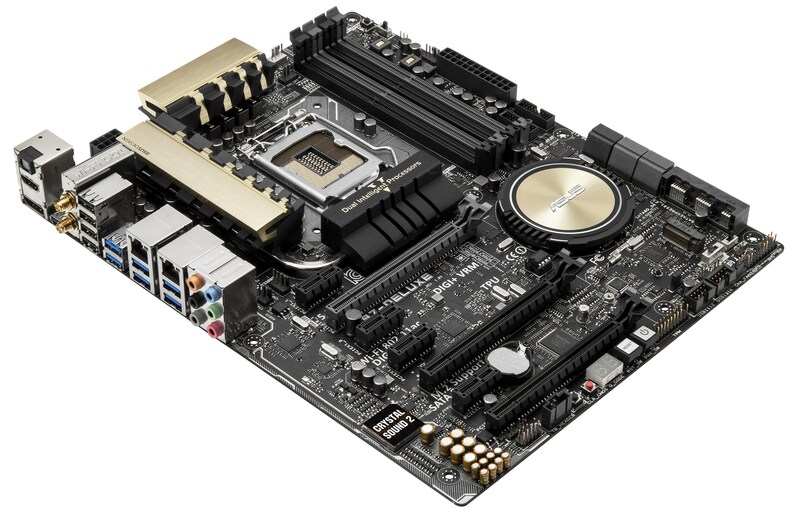 Investing in the top range motherboard should afford a few privileges. It should come with extra features, extra components in the box, and where possible the manufacturer should put time and effort into better performance. The ASUS Z97-Deluxe (NFC & WLC) tips the scales at $400, but comes with Thunderbolt 2, an NFC connection system, a Wireless Charging system, dual SATA Express, dual Ethernet ports, 2T2R 802.11ac WiFi, M.2. support and a total of 10 SATA/USB 3.0 ports. After I tested the Z97-Deluxe, I almost considered titling the review ‘Everything But The Kitchen Sink’, in light of the depth ASUS has gone to ensure that a normal ATX motherboard has as much functionality as possible. The Deluxe is going to be as near as an everything motherboard as you might get, with dual NIC + 802.11ac 2T2R WiFi, two Thunderbolt 2 ports via an add-in card, NFC, Wireless Charging, two SATA Express ports, M.2 support and 10 SATA/USB – and at $400 it should be critically analyzed. $400 might seem like an upper price limit for a Z97 motherboard, as anything more sounds a bit much. This is perhaps why we do not have a PLX chip for 4-way PCIe, a feature ASUS has left to its Z97-WS, which we will review in due course. This might mark a change in ASUS’ design, leaving 4-way PCIe devices to the workstation series, the LGA 2011 (Ivy Bridge-E) series and the gaming motherboards (Maximus Extreme). The Z97-Deluxe supports two-way SLI and three-way CrossFire, which should accommodate most LGA 1150 users not wanting a workstation motherboard. Normally a lot of flak is aimed towards high pricing motherboards, especially in this enthusiastic segment when the motherboards cost more than the CPUs (i7-4770K currently $340, i5-4670K is $240). 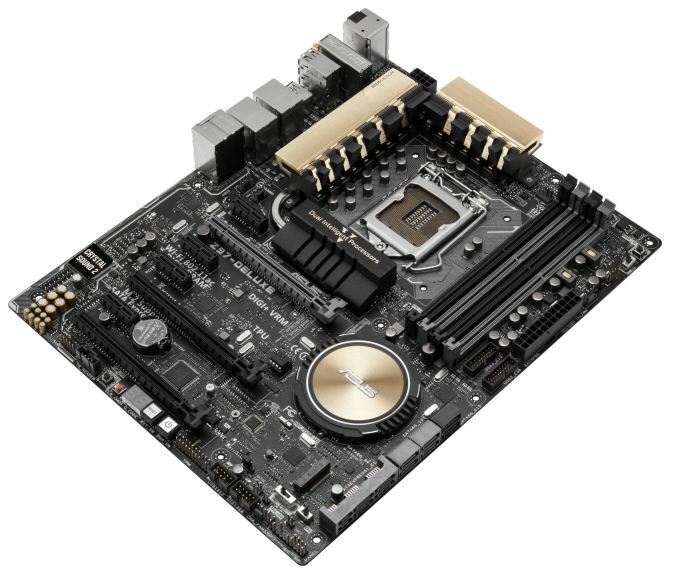 For such a price the motherboard has to offer something special and different than the rest of the range, and perhaps a few unique features that are not on any other product. The Z97-Deluxe (NFC & WLC) does this in its bundling: the included NFC and Wireless Charging utilities and the dual-port Thunderbolt 2 card add a large part of that value. The Z97-Deluxe without these additions is only $290, putting an exact $110 value on these add-ons. This in turn means that the users of the Z97 Deluxe (NFC & WLC) are keen to use these tools, and most likely on a regular basis. These tools can be used in other motherboards, and might be sold separately, but as they are in this bundle then they should probably be used with this motherboard. But that makes it a little different when the motherboard contains features that are disabled if the Thunderbolt card is used. So for example, if a user wants to use the dual Thunderbolt 2 card, it is suggested that the BIOS be adjusted such that the final PCIe slot uses x4 lanes from the chipset. This in turn disables the ASMedia SATA Express controller (one SATAe port) and the ASMedia USB 3.0 controller. If the final PCIe slot is set at x2, then only the SATA Express controller is disabled. In order to use the ASMedia SATAe port, the last PCIe slot must be disabled completely. On top of this, the M.2 slot and the other SATA Express slot share PCIe lanes. If we use one, the other is disabled. This means the user has a choice: if you use two SATAe drives, or SATA drives in the SATAe ports, then this disables M.2, two rear USB 3.0 ports and the final PCIe slot. Z97 feels more like a game of musical chairs which on the one hand is exacerbated by the storage options but calms down a bit when we realize that the hardware to exploit them is still a couple of months away from release. If we move all these extras aside and just consider the motherboard on its own, we get newer features like the EZ XMP switch (helps enable XMP without using the BIOS) alongside the storage, as well as Crystal Sound 2 which is the updated layout of the Realtek ALC1150 codec (meaning isolated PCB, EMI shield, filters and headphone amplifiers with DTS support). Perennial features now part of the ASUS fold such as USB BIOS Flashback, EPU, TPU, 4-pin fan headers that support DC+PWM modes, Wi-Fi Go! and DirectKey are all here, although DirectKey (the ability to restart into the BIOS) moves from a button to header. 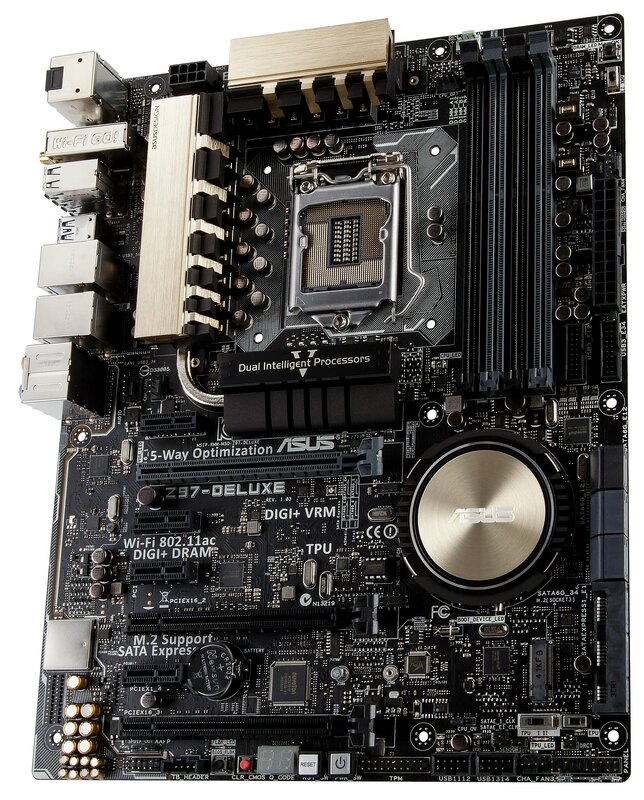 The ASUS BIOS and software are also updated for Z97. Both take advantage of features I have been pushing for a while, such as fan profiling with accurate graphs and visual presets in the BIOS. While I think a part of the aesthetic element of the BIOS has taken a step back from Z87, the new functionality in the automatic overclocking allows users to choose a combination of cooling and workload for the BIOS to push the CPU. The software is updated to 5-Way Optimization, adding in an overclock-per-software feature called Turbo App. The automatic overclocking in the OS also allows adjusting of the stress element of the test, a much needed feature. Benchmarks point the Z97-Deluxe as leading the way for integrated audio, with some of the best dynamic range and THD+N numbers we have ever seen after a driver update fixed a minor issue (similar to the one on our previous Z97 review) relating to heavy distortion at 100% speaker volume. Power consumption at idle seems high, but at load is low. The USB Turbo mode gives us some of the best USB 2.0 numbers we have seen, and manual overclocking got our CPU to 4.6 GHz quite easily. Other CPU and GPU benchmarks put the Z97-Deluxe (NFC & WLC) in the same regions as any of the other motherboards, putting the price increase firmly in terms of upgraded components, more functionality and the added NFC/WLC/Thunderbolt 2 extras. Users who buy the Z97-Deluxe (NFC & WLC) will have to specifically need those extras in order to justify the cost. For the previous series of motherboards, ASUS adopted an off-color gold for its motherboards – a sort of yellow/mustard hybrid for Z87. For Z97 it has changed again, this time towards a more metallic dulled gold with a brushed look, similar to the brushed aluminum perspective of more design conscious fashion brands. The heatsinks are the main recipients of this style change, with the power delivery heatsink on the board sporting an ‘ASUSDESIGN’ motif. The rear panel does not have this new color scheme, which is unfortunate. I think having the rear silver parts the same metallic design might homogenize the look. Nevertheless, the socket area is up against Intel specifications on all sides. The heatsinks on three sides are sufficiently low for most big air heatsinks, however should a user decide to place a large heatsink blowing left-right as well as using tall DRAM (such as G.Skill TridentX) there might be an altercation. The heatsink to the left and below the socket are joined by a heatpipe. Typically a heatsink below an 8-series motherboard was indicative of a PLX chip, however ASUS is using this merely to extend surface area for heat dissipation. The socket area has access to five of the six fan headers on the motherboard. To the bottom left near the rear panel are two 4-pin chassis headers, and to the top in between the heatsink and the DRAM slots are a CPU fan header and a CPU_OPT header for liquid cooler setups. The fifth header within reach of the socket is above the 24-pin ATX power connector, and the final header on board is at the bottom next to the USB 2.0 headers. All the fan headers on board are 4-pin and capable of DC or PWM fan functionality. The DRAM slots use single-sided latch mechanisms to make it easier to remove modules when large PCIe devices are installed. This also means that users should take care to ensure that the DRAM modules are pushed in sufficiently. At the top right of the motherboard is the MemOK button, allowing users to reboot into the system without losing CPU frequencies and just resetting the DRAM to stock speeds. Below this is a new feature on ASUS motherboards – the ‘EZ XMP’ switch. For users who do not want to enter the BIOS but still want full speed from the memory, this switch should be enabled to enable the Extreme Memory Profile of the memory used. Below the 24-pin ATX power connector are two USB 3.0 headers, both powered by an ASMedia ASM1074 USB 3.0 hub from one of the chipset USB 3.0 ports. Below this is the complex SATA port arrangement, starting with two SATA 6 Gbps from an ASMedia controller. Next are four SATA 6 Gbps ports from the chipset, and then two SATA Express connectors that contain four more SATA 6 Gbps ports. As explained by the diagram in the middle of the board, the bottom SATAe port is powered by the chipset (two SATA 6 Gbps ports and x2 lanes) and the top SATAe is via the ASMedia ASM1065E controller. This controller takes two lanes from the chipset and can allocate them to the SATA ports or the SATAe as required. Note that this SATAe slot shares bandwidth with the PCIe 2.0 x4 slot on board as well as the two rear USB 3.0 ports from an ASMedia controller. Next to the SATAe is an M.2 slot which also requires x2 lanes and two SATA ports, which it shares with the first SATA Express meaning only one can be occupied at the same time. Confused yet? The bottom of the motherboard gives an array of headers and switches. Underneath the M.2 is an extended TPU switch, one click gives an automatic overclock based on CPU multipliers and the other boosts the CPU multiplier and BCLK. Next to the TPU is the EPU, which when enabled helps to keep the power consumption of the system down. One of the changes with Z97 over Z87 is with the small header below, labeled DRCT for DirectKey. This is a header that when shorted will boot the system into the BIOS – something that a reviewer or overclocker might have frequent use of. I would prefer it as a button rather than a header, just because it means I have to find something to short the pins. To the left of the DRCT header is a T_SENSOR1 header, allowing users to add in their own thermocouple for temperature monitoring and fan control. To the left of this are two headers for the SATA Express ports, in order to pass a base clock through to the device should the drive require it. There is one for each of the SATA Express ports as required. To the left of the TPU switch is another header for increasing the voltage limits to the system. For extreme overclockers using liquid nitrogen, normal voltage limits are not enough to squeeze every bit of performance out of the motherboard, and to stop regular users burning CPUs with 1.9 volts, ASUS has relegated this option to those users who can also adjust an onboard header. 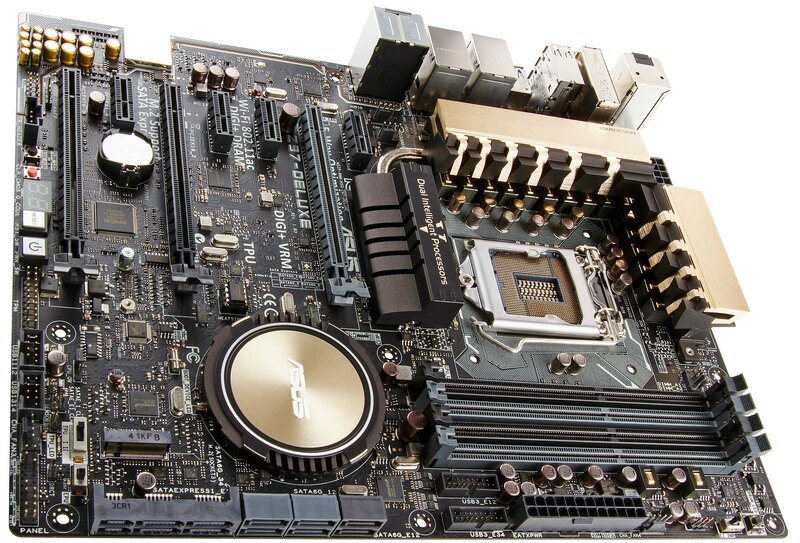 At the bottom edge of the motherboard is the normal range of headers – the front panel header, a fan header, two USB 2.0 headers, a TPM header, power/reset buttons, a two-digit debug display for POST codes, a CLR_CMOS button for resetting the BIOS, a BIOS Flashback button, the Thunderbolt header and the front audio header. 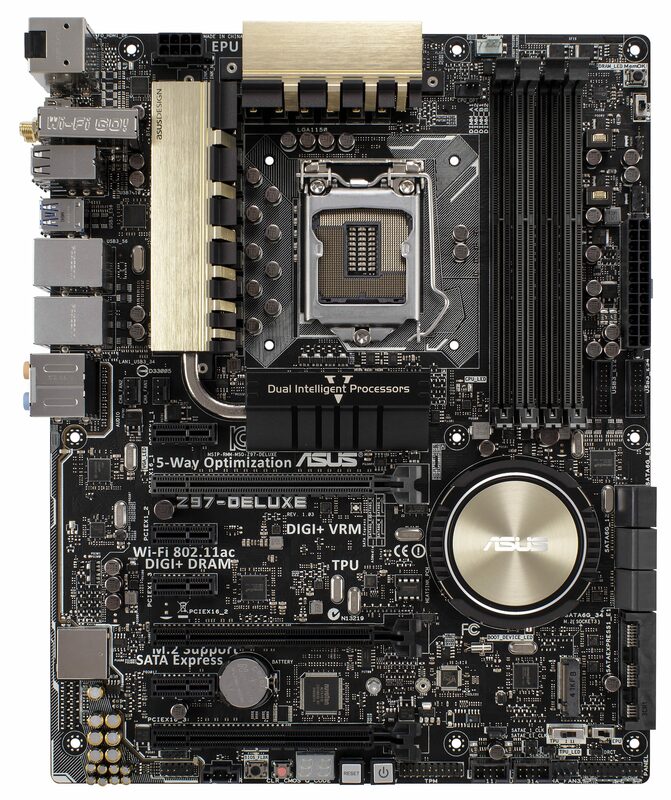 The left hand side of the motherboard contains the audio subsystem which ASUS has upgraded since Z87. Crystal Sound 2 houses a Realtek ALC1150 codec with an EMI shield, as well as separating the PCB between analog and digital signals. The filters and amplifiers help adjust the signal, including a de-pop circuit, to give some of our best audio results for onboard audio. The audio also has DTS II support. Next to the audio is the PCIe layout, offering an x1, x16 (x8), x1, x1, x8, x1 and x4 slots. The final x4 slot can be adjusted as x4, x2 or disabled as it shares bandwidth with the second SATAe port and the USB 3.0 ports on the rear panel. In order to use the bundled Thunderbolt 2 card in the package, this slot has to be in x4 mode. The rear panel uses all three digital outputs possible from an LGA1150 CPU, configured as a HDMI, a DisplayPort and a mini-DisplayPort. The 802.11ac 2T2R Broadcom module is also on the rear panel in the form of Wi-Fi Go, next to a set of four USB 2.0 ports. The back panel uses two USB 3.0 ports from an ASMedia controller (shares bandwidth with the final PCIe slot on the motherboard) and four USB 3.0 ports from the chipset. The two Ethernet ports are both from Intel, one I218V and the other I211-AT. Finally the audio jacks from the ALC1150 are also here. connectors share the same bandwidth. Personal preference would put the DirectKey back as a button, but I doubt that many users would care much about it. The complexity of using this storage vs. disabling another feature is a little complex, perhaps too much so. Because storage is still driven (perhaps erroneously) by peak read/write speeds, it cannot be hidden behind a PLX chip (such as the 8608) where the uplink is of fewer lanes. One way to get around this issue might be the PLX8747 chip on the CPU, splitting the 16 CPU lanes into 32 (refer back to our big PLX8747 Z77 review to refresh on how the PLX works here). With 32 lanes, we can split into four groups of 8. Two groups of 8 can do GPU duties, combining for a single GPU and using a switch to split into two lots of x8 when dual GPUs are required. The other two sets of 8 can be used to supply SATA Express slots, M.2 slots and other controllers. Because there are limits to how many endpoints can be generated via the PLX chip, other ICs (such as the PLX8717, which takes in x8 and can put out x4/x4, or take in x4 and output x4/x2/x2) might be required, which will drive up cost but allow all the ports to be used together. So crazy ideas such as a motherboard with SLI capabilities, four M.2 x2 slots and two PCIe 2.0 x4 slots could be possible. Or given the propensity for one manufacturer to play with LSI chips for more SATA ports, that is another option. Nice board here, as usual, from Asus. I must say though, being a shallow man, that I would love to see and end to this gold design scheme and a return of my beloved blue. The blue scheme was ugly, and far too bright. It was also a very cold color.